Did Obama Order Total Information Shutdown on Afghanistan? In a stunning and blatantly obvious move to try to hide its failed efforts in Afghanistan, the military suddenly decided back in October that they would classify any and all information on the capabilities of Afghan National Security Forces (ANSF) despite data having been provided to the Special Inspector General for Afghanistan Reconstruction (SIGAR) for the 24 quarterly reports that preceded the one dated October 30, 2014 (pdf). Initial digging on that classification decision appeared to put the classification decision in the hands of ISAF Joint Command. The head of ISAF Joint Command then broke his own classification of ANSF capability a few days later when he proclaimed that ANSF is a “hugely capable fighting force” in a news briefing. The timing for this classification couldn’t have been worse. US forces were in the final stages of the handoff of Afghan security to ANSF and Barack Obama eventually relied on butchered semantics to proudly proclaim that the war was over, despite a residual fighting force to which he had secretly given expanded combat powers. As the New York Times article linked above points out, the military also initially tried to classify the number of US forces present in Afghanistan and only relented on that point when it was pointed out that the number had already been released by the Obama Administration. Campbell then had the temerity to add later in his letter that he is “committed to maximum transparency in our operations”. Just wow. That sounds like Obama declaring himself the most transparent President ever, and then going on to rely on expanded classification coupled with unprecedented levels of prosecution of whistleblowers. Despite the requirement of Public Law 110-181 that federal agencies provide requested information or assistance to SIGAR, the State Department did not answer any of SIGAR’s questions on economic and social-development this quarter, and failed to respond to SIGAR’s attempts to follow up. Had only one Federal agency, the Defense Department, suddenly shut down the flow of information, it would have been easy to believe that they were ones trying to hide their own failures. But now that a second agency, the State Department, has shut down information flow at the same time, and won’t even provide an explanation for their move, it seems clear to me that the order to shut down information flow had to come from above. With both the Defense Department and State Department going silent, could such an order have come down from anyone other than Obama himself? The failure that is our Afghanistan war has entered its fourteenth year, has spanned two presidents and is now being summarily swept under the rug by the Most Transparent Administration Ever®. Postscript: For more evidence on just how failed the Afghanistan effort has been, recall that John Kerry’s brokered extra-constitutional National Unity Government was over three months late in finally announcing a full slate of 19 cabinet nominees. Sadly, the slate included poorly screened candidates and the Afghan Parliament yesterday rejected 10 of those nominees while voting to confirm only 9.
https://www.emptywheel.net/wp-content/uploads/2016/07/Logo-Web.png 0 0 Jim White https://www.emptywheel.net/wp-content/uploads/2016/07/Logo-Web.png Jim White2015-01-29 09:38:542015-01-29 09:38:54Did Obama Order Total Information Shutdown on Afghanistan? Did ISAF Joint Command Chief Leak Classified Information on Afghan Troop Capabilities? 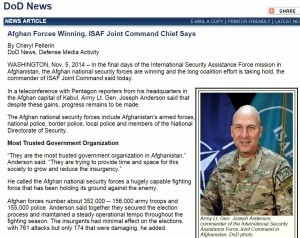 In the final days of the International Security Assistance Force mission in Afghanistan, the Afghan national security forces are winning and the long coalition effort is taking hold, the commander of ISAF Joint Command said today. In a teleconference with Pentagon reporters from his headquarters in the Afghan capital of Kabul, Army Lt. Gen. Joseph Anderson said that despite these gains, progress remains to be made. The Afghan national security forces include Afghanistan’s armed forces, national police, border police, local police and members of the National Directorate of Security. He called the Afghan national security forces a hugely capable fighting force that has been holding its ground against the enemy. This quarterly report also examines the reconstruction effort across the security, governance, and economic sectors. In the security sector, SIGAR was deeply troubled by the decision of the International Security Assistance Force (ISAF) to classify the executive summary of the report that assesses the capability of the ANSF. For years, SIGAR has used the ISAF report as a primary metric to show Congress and the public the effectiveness of the $61.5 billion U.S. investment to build, train, equip, and sustain those forces. Prior to this quarter, aggregate data on the operational effectiveness of the ANSF were unclassified in the Regional ANSF Status Report (RASR) as well as its predecessors, the Commanders’ Unit Assessment Tool (CUAT) and the Capability Milestone rating system. 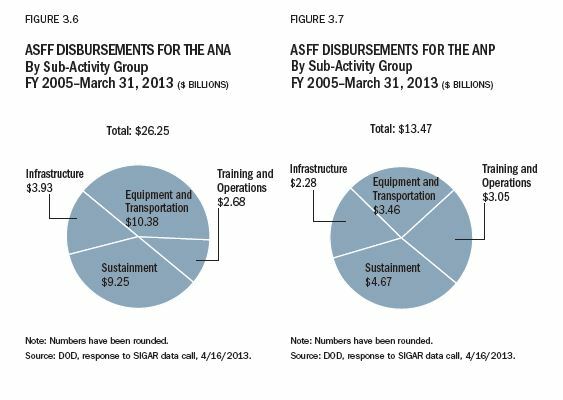 ISAF’s classification of the report summary deprives the American people of an essential tool to measure the success or failure of the single most costly feature of the Afghanistan reconstruction effort. SIGAR and Congress can of course request classified briefings on this information, but its inexplicable classification now and its disappearance from public view does a disservice to the interest of informed national discussion. Moreover, while SIGAR understands that detailed, unit-level assessments could provide insurgents with potentially useful intelligence, there is no indication that the public release of aggregated data on ANSF capabilities has or could deliver any tactical benefit to Afghan insurgents. 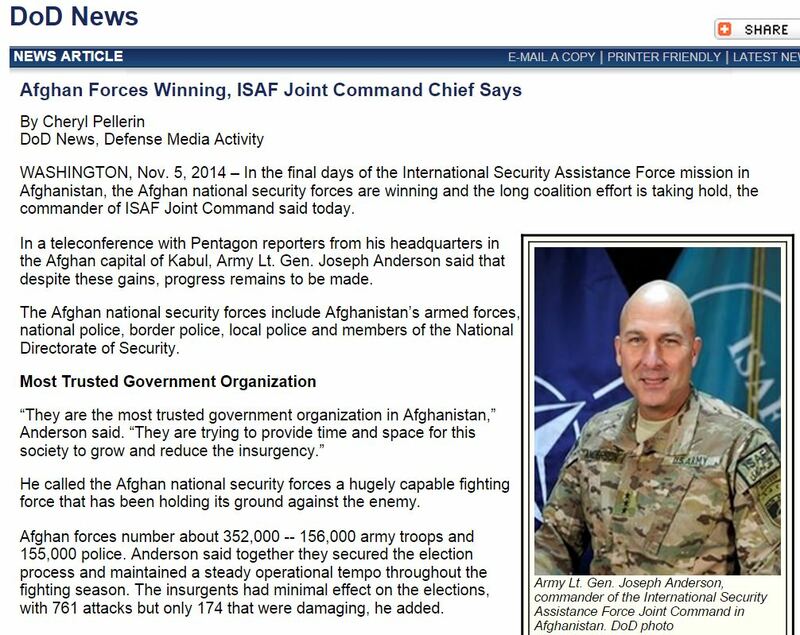 So ISAF classifies the Regional ANSF Status Report but then unleashes the chief of ISAF Joint Command to make a statement that ANSF is “hugely capable” even though, as SIGAR notes, the public now has no way to have an “informed national discussion” on whether Anderson’s claim has any basis. I’m sure that leak investigation will get started any century now. https://www.emptywheel.net/wp-content/uploads/2016/07/Logo-Web.png 0 0 Jim White https://www.emptywheel.net/wp-content/uploads/2016/07/Logo-Web.png Jim White2014-11-06 08:42:142014-11-06 08:42:14Did ISAF Joint Command Chief Leak Classified Information on Afghan Troop Capabilities? The Special Inspector General for Afghanistan Reconstruction just released the 25th quarterly report (pdf) on US reconstruction efforts in Afghanistan. We are of course at a major crossroads in US involvement in Afghanistan, as US and NATO combat involvement are being phased out and Afghanistan assumes responsibility for its own security. Some US and international troops will remain in Afghanistan after the end of this year under the new Bilateral Security Agreement, but with Afghanistan in charge it is of utmost importance that the Afghan National Security Forces (ANSF) are fully staffed and functional so that they can take on their responsibilities. One of SIGAR’s key roles in its oversight activity through the years has been to collect and review information coming directly from ISAF, the International Security Assistance Force, concerning the recruitment, training and subsequent capabilities of ANSF. ISAF ostensibly is a NATO team but is of course dominated, both in command and in personnel, by the US military. It is very difficult to see this move by ISAF as anything more than a blatant attempt to cover up massive failure on the part of the efforts to train Afghan troops to take over their own security functions. This move by ISAF follows previous efforts that also come off as attempts to game the system so that evaluation of the always-claimed “progress” is difficult to impossible. Note in Sopko’s letter that he refers to three different systems by which troop readiness has been analyzed and reported. First, we had the Capability Milestone system, which was replaced by the Commanders’ Unit Assessment Tool (CUAT) and the now-classified Regional ANSF Status Report has replaced CUAT. Since the implementation of the CUAT, the titles of the various rating levels have changed, as shown in Table 3.3. In July 2012, the Government Accountability Office (GAO) raised concerns that the change of the title of the highest rating level from “independent” to “independent with advisors” was, in part, responsible for an increase in the number of ANSF units rated at the highest level. GAO also noted that “the change lowered the standard for unit personnel and equipment levels from ‘not less than 85’ to ‘not less than 75’ percent of authorized levels.” In a response to SIGAR last quarter, the IJC disagreed with GAO’s assessment, saying a change in title does not “equal a change in definition.” Since last quarter, the IJC has initiated a CUAT Refinement Working Group to standardize inputs and outputs in the areas covered by the assessments. But it turns out that the CUAT itself was developed only when SIGAR initiated an audit (pdf) of the Capability Milestone rating system. So, twice, when SIGAR decided to audit the system for evaluating Afghan troop readiness, ISAF responded by developing a totally new system, creating a strong discontinuity in the ability to track Afghan troop readiness over time. And now that we are at the most important moment for Afghan troops to be ready, ISAF decides that any information at all on their readiness is classified, even though they have provided the very same information without classification for years. As I have noted previously, Congress requires the Defense Department to provide status reports on the situation in Afghanistan twice a year. The scheduling of these reports appears to be entirely random. The first report in 2012 was in April, but since there was an election in the US in November, it appears that the Defense Department and the Obama administration managed to delay the next report for several months, so that it was published in December instead of October. The next report in this series has now been released (pdf), about seven and a half months after the December 2012 report was released. So much for that “semi-annual” requirement from Congress. The next interval will have to be significantly shorter than six months if there are to be two reports in 2013. I am still taken aback each time I open one of these reports, since the title is always “Progress Toward Security and Stability in Afghanistan”. Aside from the fact that even with Afghans self-reporting their own troop strength, the Defense Department can only report an overall ANSF force size of 333,368 as of January, 2013, well short of the fabled 352,000 overall ANSF force size that the Obama administration and media spout regularly. But the abject failure displayed in how these Afghan troops have been deployed as they take over primary responsibility for security in the country is staggering. Many bases are being abandoned in Afghanistan as Afghans take over primary security responsibility. 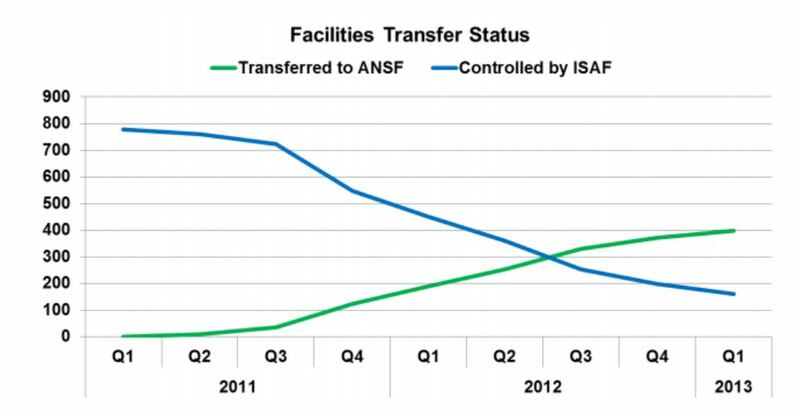 Note that ISAF starts off with more or less 800 facilities at the beginning of 2011. At the end of the graph, ISAF appears to be in charge of only about 175 facilities and yet the ANSF has only taken over 400 facilities. That leaves between 200 and 225 facilities abandoned, presumably because the ANSF cannot defend them. In other words, of the over 600 facilities ISAF has withdrawn from, less than two thirds of them can be defended or maintained by Afghan forces. Afghanistan has more than twice as many troops as ISAF, and yet it can maintain only about two thirds of the facilities that ISAF is exiting. How can the Defense Department continue to claim “progress” in Afghanistan when the large force it has trained is not capable of maintaining ISAF-established facilities with more than twice as many troops? And with the number of bases going down by at least a third, how can Afghanistan be expected to provide anything near the level of security that ISAF provided? Figure 4 illustrates the number of ISAF bases transferred to the ANSF. Many—but not all—ISAF bases that have been closed have been transferred to the ANSF. 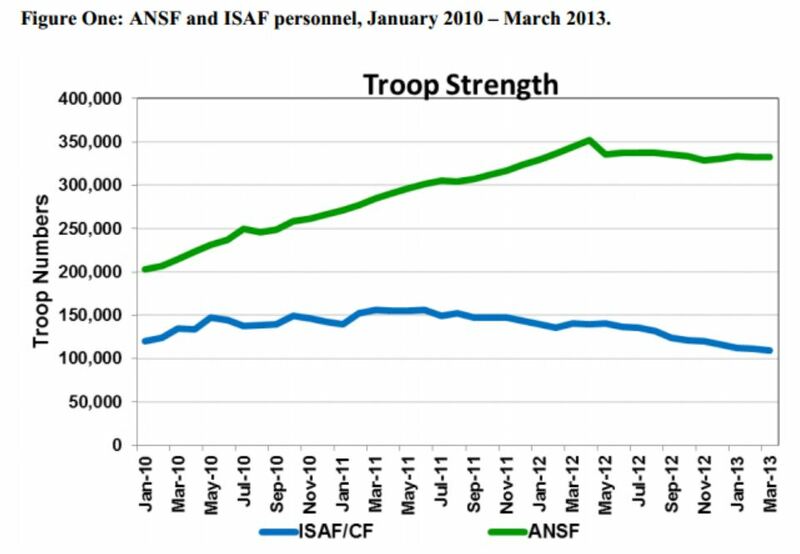 This demonstrates the drawdown of ISAF forces and their shrinking footprint and evolving mission as well as the growth of the ANSF. Yup, abandoning over 200 bases would indeed qualify as “not all” of those ISAF has exited being transferred to ANSF control. Postscript: I chose a really bad time to take a few days off. While I was gone, this Defense Department report, the latest SIGAR quarterly report on Afghanistan and the latest UNAMA report on civilian casualties all came out. I will try to dig through this report more thoroughly as well as the other reports over the next few days. Determining ANSF strength is fraught with challenges. U.S. and coalition forces rely on the Afghan forces to report their own personnel strength numbers. Moreover, the Combined Security Transition Command-Afghanistan (CSTC-A) noted that, in the case of the Afghan National Army, there is “no viable method of validating [their] personnel numbers.” SIGAR will continue to follow this issue to determine whether U.S. financial support to the ANSF is based on accurately reported personnel numbers. There are several important bits to unpack in that paragraph. First, note that even though the US (well, officially, NATO) is training the Afghan forces, it is the Afghans themselves who report on their force size. It appears that our training of the Afghans, however, has not trained them on how to count personnel in a way that can be validated. But the end of the paragraph is the kicker, because it appears that our financial support of the Afghans is based on their own reporting of the force size. Since we are paying them for the force size they report, why wouldn’t they inflate the numbers to get paid as much as possible? The Afghans know that the bulk of US policy is built around the 352,000 force size myth, so they know that there will be absolutely no push-back (aside from an obscure SIGAR report that only DFH’s will read) for inflating the number to get the result the US desires. For further enticement, recall that NATO has proposed extending the time over which a force size of 352,000 will be supported, in a move that I saw as a blatant attempt to dangle an additional $22 billion ready for embezzling in front of Afghan administrators. It comes as no small surprise, then, that SIGAR has found that the Afghan-reported numbers somehow manage to include over 11,000 civilians in the reports for security force size that is specifically meant to exclude civilian personnel. Before the outbreak of green on blue killings that eventually led to a significant interruption in the training of Afghan security forces last September, it was impossible to read a statement from the US military or NATO regarding future plans without encountering a reference to a required 352,000 force size for combined Afghan National Security Forces. It was our training of the ANSF that was touted as our primary reason for remaining in Afghanistan because we need those trained troops available to take over security responsibility as we withdraw. I have been insisting since the interruption that it will be impossible to continue to claim that a functional ANSF force size of 352,000 can be achieved, as the known high rate of attrition continued during the training interruption. No new troop size prediction has emerged, but it was significant to me that references to the 352,000 force size claim had seemed to disappear. Beyond 2014, America’s commitment to a unified and sovereign Afghanistan will endure, but the nature of our commitment will change. We’re negotiating an agreement with the Afghan government that focuses on two missions — training and equipping Afghan forces so that the country does not again slip into chaos, and counterterrorism efforts that allow us to pursue the remnants of al Qaeda and their affiliates. Events on Wednesday, Thursday and early Friday in Afghanistan stand as a stark reminder that killings now take place for such a variety of reasons and by such a variety of groups that assigning blame and motivation becomes extremely difficult. A man in an Afghan police uniform shot and killed two American service members Thursday, in what appeared to be the latest in a rash of attacks on international forces this year by their Afghan partners. In Thursday’s shooting, authorities had yet to determine if the attacker was an Afghan police officer or an insurgent who had donned a uniform to get close to the Americans, said Maj. Lori Hodge, a spokeswoman for U.S. forces in Afghanistan. The assailant escaped after killing the service members while they were out on a late morning patrol in the southern Uruzgan province, she added. It was the second suspected insider attack in two days. On Wednesday, two British service members and an Afghan police officer were killed in an “exchange of gunfire” in Helmand province, the British Ministry of Defense said in a statement. The Afghan officer was not wearing his uniform and the statement said it was not clear who started shooting first. The pair are thought to have been killed by insurgents, though the BBC said an Afghan source claimed the deaths were from a “green on blue” attack – where coalition troops are killed by their Afghan allies. According to local authorities in southern Helmand province of Afghanistan, British troops based in southern Helmand province killed two of their comrades in a friendly fire in this province. Provincial security chief spokesman Farid Ahmad Farhang confirming the report said the incident took place in Greshk district while British troops were patrolling in the area.